If you are a fan of Capcom games, then this offer will be the best present for you. Recently two different retailers have announced Capcom Essentials pack that consists of five best company's projects for the very pleasant price - $59.99. 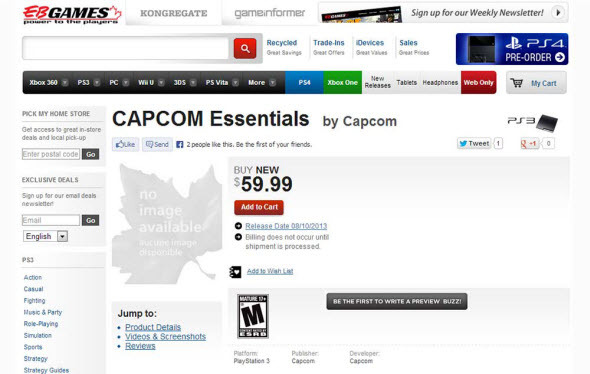 The Capcom Essentials pack includes Devil May Cry 4, Super Street Fighter 4, Mega Man 10, Dead Rising 2 and Resident Evil 6. These five games in one bundle will be available on the 8th of October, according to the retailers, but officially the developers haven't confirmed anything yet. Also this pack hasn't been listed in other popular Internet game shops. But still we hope that such an interesting and advantageous pack will reach the gamers. For those who have forgotten, we would like to recall that Devil May Cry 4 is an action-adventure with hack and slash elements that was released in 2008. Super Street Fighter 4 is a fighting game that features 35 different characters. Mega Man 10 is an action-platformer about the powerful robot that appeared in the shops in 2010. Dead Rising 2 is a survival horror with comprehensive multiplayer modes, and the details of the last game in the list can be found in our Resident Evil 6 review.